Look carefully at the shape of these Pocky sticks. The popular Japanese snack has had a makeover and are now available in a heart-shaped from top to bottom, which means more delicious strawberry chocolate for you! These spectacularly detailed works of art are just as good as the real thing! Wire bonsai trees require no water or constant upkeep and will create a calm environment, making them ideal for home or the workplace. Featuring cat like ears and paws, this sleek and adorable ring will greatly amplify any outfit’s kawaii factor! Made from sterling silver ring, to adjust all you need to do is slowly stretch the pawtips until you have the purr-fect fit! Now fans of the world’s most famous cat can take selfies that are cuter than ever! This unique instant camera comes in the shape of Hello Kitty’s head, it even includes her signature bow on the front. A must have for the avid Hello Kitty merchandise collector. 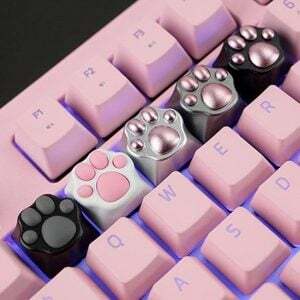 These cat paw mechanical keyboard caps are the ideal way to keep your work space looking as kawaii as possible! The novelty keyboard cap can replace any key on your keyboard and are great for cat enthusiasts. If you love Japan and sugar, you’ll love Konpeito candy! These colorful and delicious candies are made almost entirely from sugar and come delivered straight to your door. A wonderful and super sweet surprise for any otaku! As wonderful and delicious as sushi is, there’s always that little bit of sadness when you’ve finished your plate. With these adorable sushi cushions you can always get to enjoy your favorite Japanese cuisine any time of the day! Give to your #001 a personalized gift with these totally adorable Bulbasaur planters! Specially designed for Valentine’s Day, these little planters come with a heart shaped saucer for drainage and are available in three different sizes. If you’re a fan of Pocky, Japan’s addictive cookie sticks, you’ll just love these chopsticks! They look exactly like real Pocky, but are much longer and solid to make them more practical to eat with. A great gift for any Pocky lover! Carry around a little piece of Spring time in Japan with you always! These stunning cherry blossom rings are handmade from resin and come available in four styles inspired by each of the seasons of the cherry blossom tree. This bright book-light-of-the-deep is a pink, kawaii version of the anglerfish! Its body pivots on a hinge, allowing you to clamp it wherever you need a bit of light: at a workstation, while doing crafts, or, of course, while reading a book. Pocky is the primary food source for the Otaku and is available in many addictive flavors. Avoid those horrible outside interactions while stocking up on your chocolate supply with this variety pack of Pocky delivered to your door. Nestlé has transformed wasabi’s trademark burn into a feeling of flavor! According to the reviews, this Kit Kat isn’t actually spicy, but does manage to retain a subtle taste of wasabi with an added bit of sweetness… which is probably for the best.